Recently, at one of my client’s place, I have to design a screen with lot of ALVs. When I started designing, I didn’t pay much of the attention to the fact that there could be a dependency between main ALVs and other sub-ALVs. Later in the design phase, I understood that this is a great opportunity to implement Observer Design Pattern and make maintenance easy and fast. 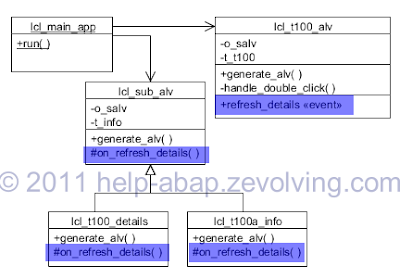 If you haven’t yet read the basics of Observer, I would strongly suggest to read ABAP Objects Design Patterns – Observer. The requirement was to have a screen with one main ALV and 2 sub ALVs. Later on the requirement changed and we had to add another 2 sub ALVs. At that point of time, I decided to use Observer to be able to react to any new requirement and refresh all Sub ALVs. To be able to explain the problem easily, I have created the reduced version of the requirement and its before and after solution. 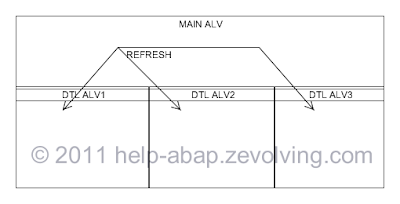 For demo purpose, we’ll create 1 main ALV and 2 Sub ALV. 2 Sub ALVs should be refreshed with new data whenever we double-click on main ALV. Lets see the UML for this. I have created a public method REFRESH_KIDS( ) in the class LCL_MAIN_APP. I call the method, from the main ALV, LCL_T100_ALV. I call the REFRESH( ) method of each sub ALV object. This translates into: Whenever I need to add another ALV, add an attribute in LCL_MAIN_APP, add into the REFRESH_KIDS method. The code lines for this demo. You need to create a normal screen 0100 and also create a PF-STATUS ZOBS. METHODS: generate_alv IMPORTING io_cont TYPE REF TO cl_gui_container. DATA: o_salv TYPE REF TO cl_salv_table. DATA: t_t100 TYPE STANDARD TABLE OF t100. METHODS: generate_alv ABSTRACT IMPORTING io_cont TYPE REF TO cl_gui_container. METHODS: refresh ABSTRACT IMPORTING iwa_t100 TYPE t100. DATA: t_info TYPE STANDARD TABLE OF ty_info. CLASS lcl_t100_details DEFINITION INHERITING FROM lcl_sub_alv. CLASS lcl_t100a_info DEFINITION INHERITING FROM lcl_sub_alv. CLASS-METHODS: refresh_kids IMPORTING iwa_t100 TYPE t100. CLASS-DATA: lo_t100_details TYPE REF TO lcl_t100_details. CLASS-DATA: lo_t100a_info TYPE REF TO lcl_t100a_info. SET HANDLER handle_double_click FOR lo_events. READ TABLE t_t100 INTO wa_t100 INDEX lv_index. DATA: lwa_info LIKE LINE OF t_info. INTO lwa_t100a WHERE arbgb = iwa_t100-arbgb. DATA: docking TYPE REF TO cl_gui_docking_container. DATA: lo_t100_alv TYPE REF TO lcl_t100_alv. lo_ch2    TYPE REF TO cl_gui_container. DATA: lo_temp TYPE REF TO cl_gui_container. Here is the updated UML. Replaced methods REFRESH( ) in subALVs with methods ON_REFRESH_DETAILS as a event handler of the event REFRESH_DETAILS of the main ALV. 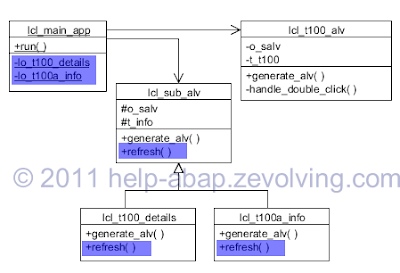 Registering the event handlers for the SubALVs while generating the ALVs in the method RUN of the LCL_MAIN_APP. Code lines with Observer. You need to create a normal screen 0100 and also create a PF-STATUS ZOBS. EVENTS: refresh_details EXPORTING value(wa_t100) TYPE t100. SET HANDLER on_refresh_details FOR ALL INSTANCES. INTO lwa_t100a WHERE arbgb = wa_t100-arbgb. DATA docking TYPE REF TO cl_gui_docking_container. DATA: lo_t100_alv     TYPE REF TO lcl_t100_alv. DATA: lo_t100_details TYPE REF TO lcl_sub_alv. DATA: lo_t100a_info   TYPE REF TO lcl_sub_alv. CREATE OBJECT lo_t100_details TYPE lcl_t100_details. CREATE OBJECT lo_t100a_info TYPE lcl_t100a_info. After implementing Observer, it is very easy to add any new SubALV in this functionality. We can simply inherit the subclass and register the event handling for that. Of course, we need to instantiate the ALV class itself but apart from that, we don’t need to modify anything in existing object. Hi Naimesh! Thanks for this really practical example of how to use the observer!! thank you very much for this fast delivery of the complete example. It looks very fine and I think that it will fit perfectly in my research work. I will have a look asap on it and get back to you with feedback and the results of the applied methodology that hopefully work. Good post. I haven’t had to do this so never thought about it. Thanks for stretching my mind!